Welcome to the first “ALUMnews” email newsletter produced by Mount Carmel College of Nursing for alumni. Most of us intend to stay in touch after graduation. While we are sincere, life moves forward and often gets in the way of truly remaining connected with classmates. There's no shame in that. As there's no doubt we hunger for those connections and feel re-energized by relating once again with those who shared a journey with us. And it is comforting to know that our friends and cohorts from the past are moving along and making a difference 10, 20, 40 years later. 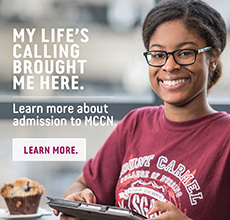 Welcome to the inaugural edition of the Mount Carmel College of Nursing alumni newsletter—to connect our graduates and provide you with information and news about MCCN. You've heard the timeless adage, "It takes a village." 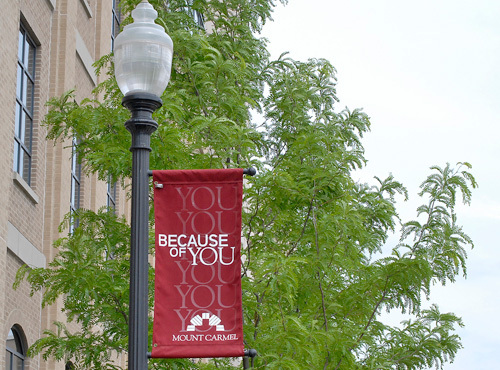 I consider the MCCN community and Mount Carmel alumni that village where each of us—faculty, staff, administration, students and alumni—do our part to give the College its strength. This ALUMnews highlights just a few of our strengths, including new Alumni Association co-presidents, Michele Uhl Born and Susie Loik Parsons. I am enthused by their leadership and the Alumni Board’s strategic plan. Sincerity and depth are not the kinds of words often associated with advertising campaigns. Yet those two descriptions are exactly why the Mount Carmel Health System's current marketing effort "Because of You" has been so memorable and so successful. The campaign has impressed television viewers and radio listeners since it was rolled out in the Central Ohio market during the national football championship game between Alabama and Notre Dame. In fact, calls even have been coming in from people moved by the message - a rare step for anyone inspired by a commercial. “It has really resonated” with people, said Robyn Morton, director of marketing for Mount Carmel Health System. 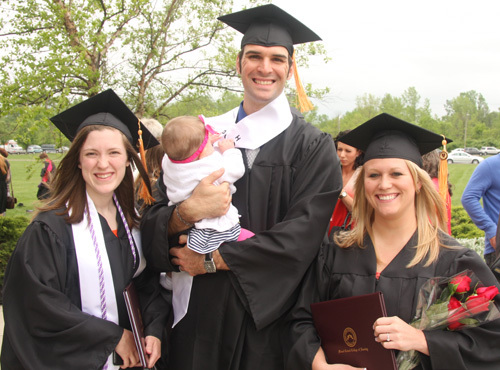 Several all-time highs were attained during Mount Carmel College of Nursing’s Commencement ceremony May 11. The 2013 Commencement included a record-setting 147 pre-licensure BSN candidates and 36 MS candidates, which also was the highest ever. “May 2013 marks the second year in a row that the College had the largest number of students ever walking at Commencement,” said Karen Greene, BS, Director, Records and Registration. The Ohio Hospital Association named MCCN alumnus Jeremy Daugherty, RN, BSN, Nurse Manager for Surgery at Mount Carmel East (MCE), as a finalist for the Albert E. Dyckes Health Care Worker of the Year Award. 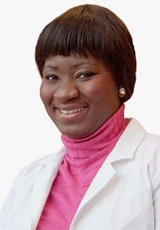 The statewide award honors a hospital employee who demonstrates leadership, reflects the values and ideals of Ohio’s health care facilities, goes above and beyond, gives back to the community and has overcome odds to succeed. When did you first feel the call to be a nurse? At the start of high school. My mom's a nurse and she inspired me.